LOS ANGELES – In a point guard league, Chris Paul proved why he’s the best in the game on Saturday night at Staples Center. Paul scored 24 points, 8 rebounds and had 12 assists as the Clippers defeated the Philadelphia 76ers 127-91 for their third consecutive victory. 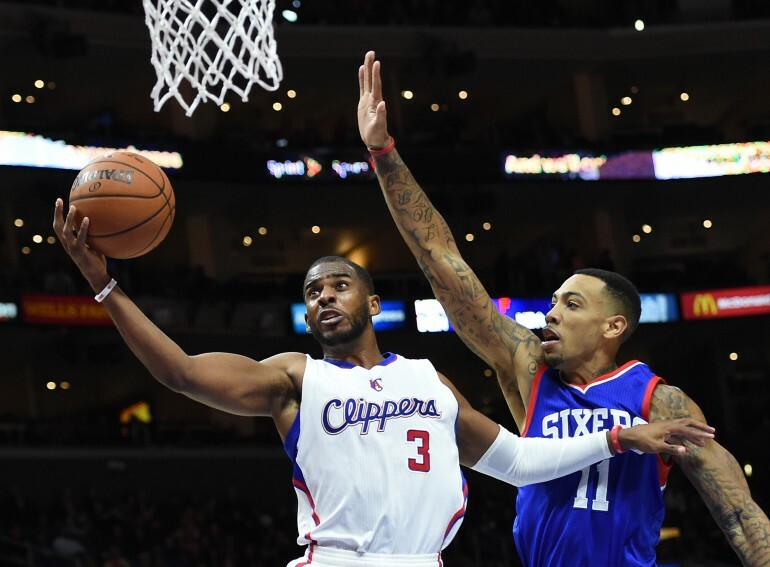 The pesky 76ers didn’t cower in the wake of the mighty Clippers. They hung around for most of the game, even getting within four to start the second half until the Clippers erupted at the end of the third quarter. The Clippers took a 14-point lead into the 4th and never looked back as they cruised to victory. J.J. Redick continued his torrid shooting pace in the first quarter for the second game in a row, scoring 10 points in the first few minutes. He finished the game with 17 points and three big shots from downtown. Blake Griffin had 15 points and DeAndre Jordan controlled the glass again with a team high 10 rebounds. None of the team’s five starters played in the fourth quarter as the game was well in hand by that point. Tony Wroten was inserted into the Philadelphia starting lineup before the game as second year man out of Syracuse, Michael Carter-Williams re-aggravated his shoulder before the game. Wroten played well in MCW’s stead finishing with 27 points and 7 assists. Rookie, Robert Covington, out of Tennessee also had a strong showing with 23 points and four three-pointers. Nerlens Noel played against the Clippers for the first time in his career and had a couple impressive dunks to go with his game high 12 rebounds. It’s been a tough stretch for Philadelphia who have 18 games in 32 days including nine back-to-backs. They have now lost five consecutive games all on the West Coast as they were blown out by Portland, Utah, Golden State, and Phoenix before losing to Los Angeles tonight. “It was a great experience for us to play perennial All-stars in this league, from guards to big men, to be able to hold our own for some of these games, and the experience itself – experience is the number one teacher,” said an optimistic Noel. Michael Carter Williams aggravated his shoulder before the game and was a late scratch for the 76ers. Joel Embid, Jason Richardson and Hollis Thompson all missed the game for the 76ers. Andrei Kirilenko who was traded to the 76ers last month and was listed on the 76ers roster before the game was not on the bench and still has not reported to the team. Clippers Ring In New Year With Rout Of Knicks!